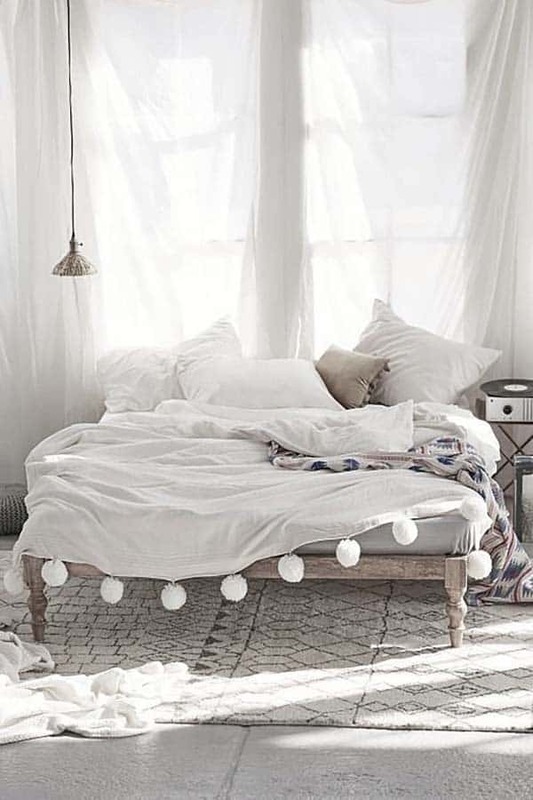 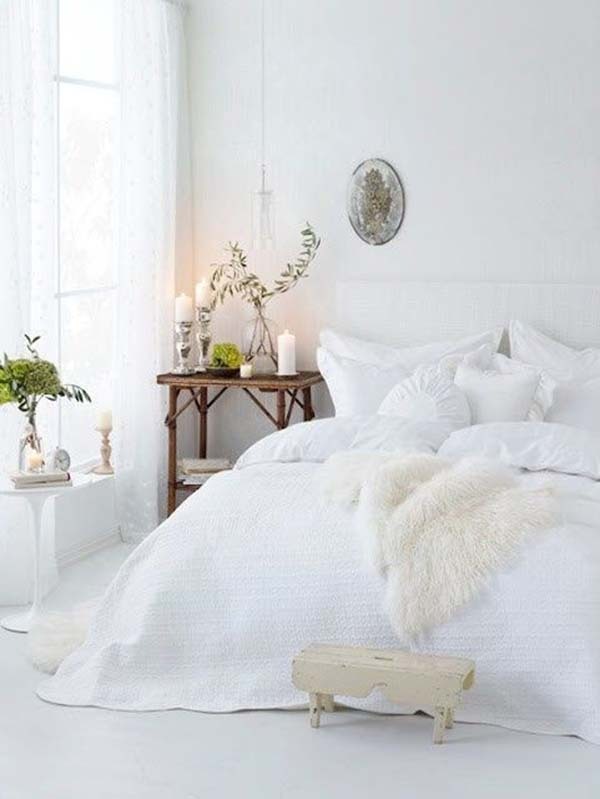 An all white bedroom can be extremely cozy and serene, adding textures and patterns and layering varying shades of white can create a dreamy bedroom aesthetic. 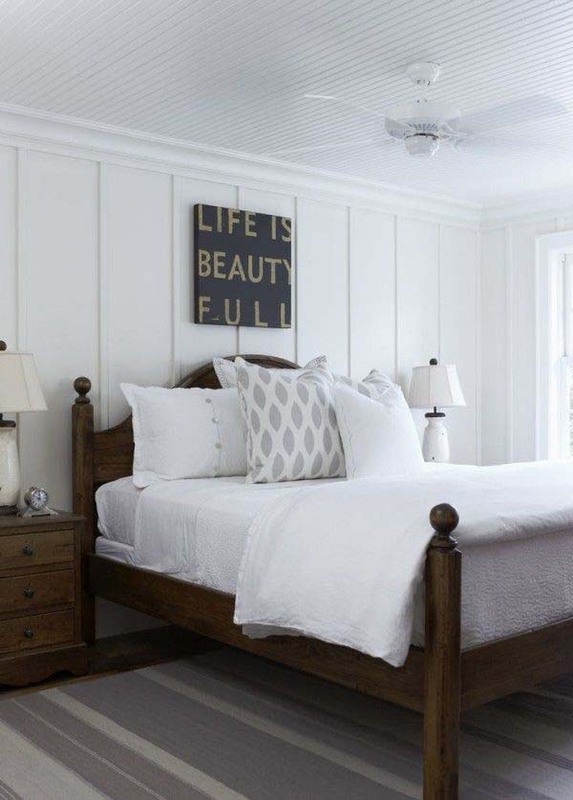 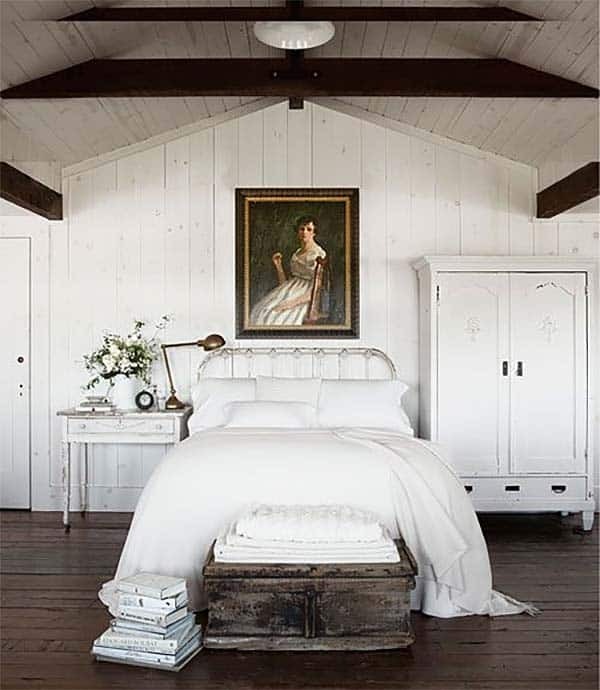 An all white bedroom does not have to be cold and sterile, it can create the illusion of spaciousness, conceal imperfections and add a softness to the architecture of a space. 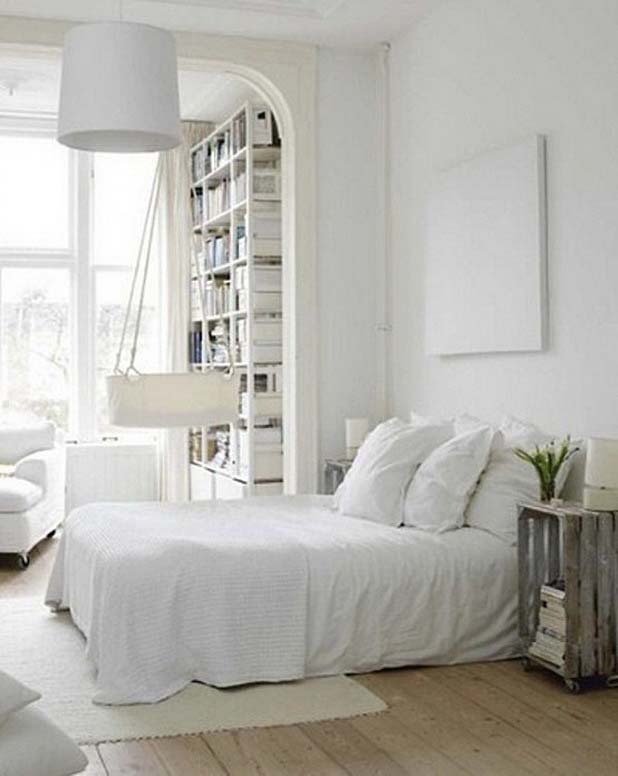 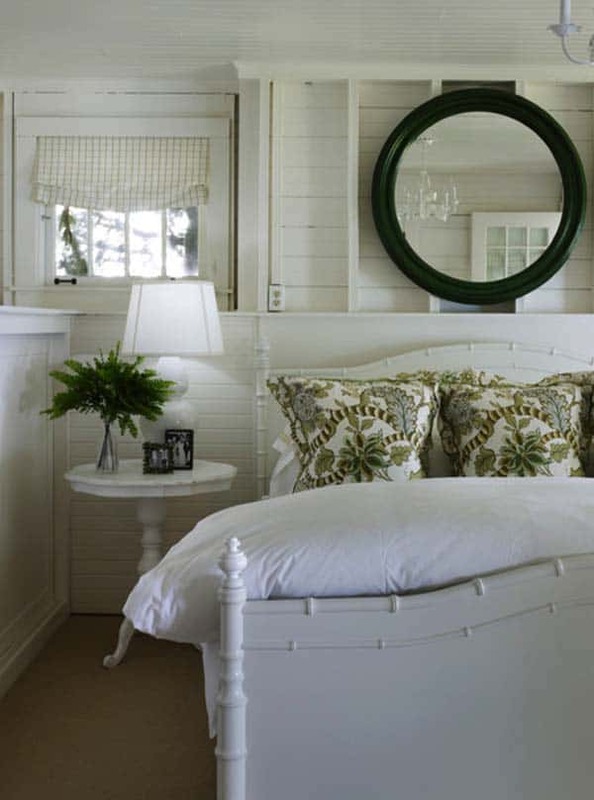 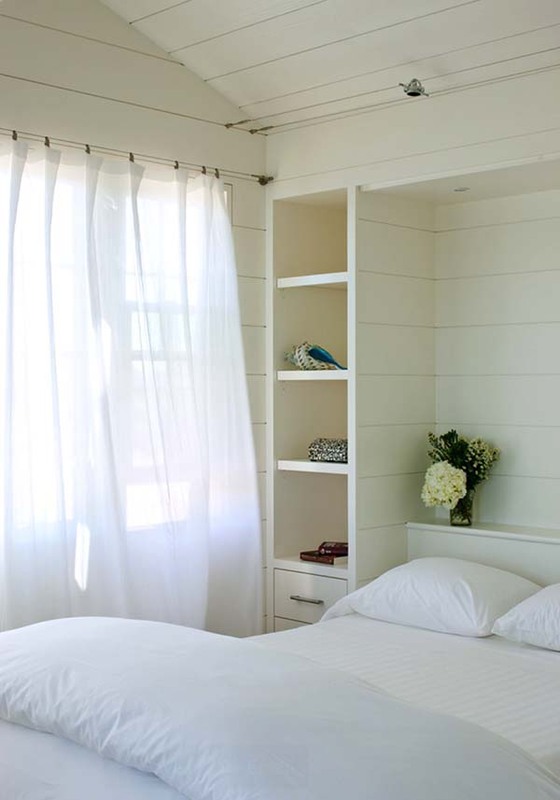 A fresh coat of crisp white paint will instantly help to draw light into any bedroom. 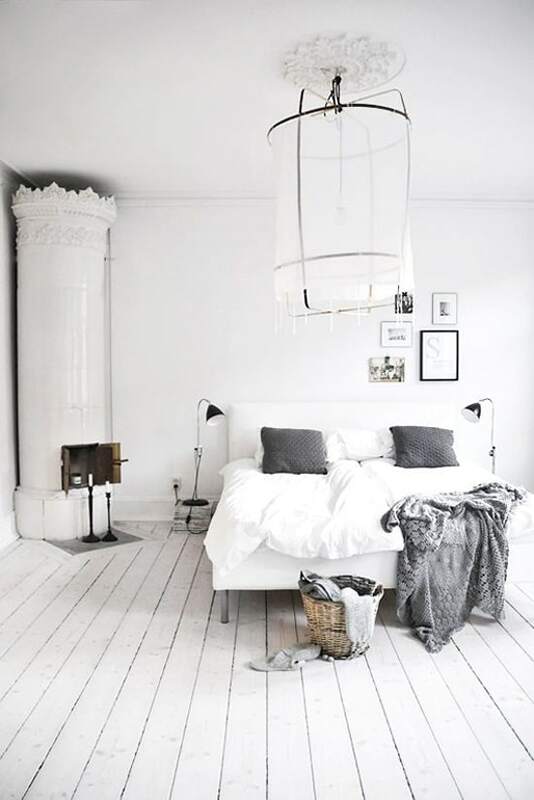 White makes a great neutral base to create varying styles such as romantic, modern, vintage, shabby chic, nordic, so many possibilities! 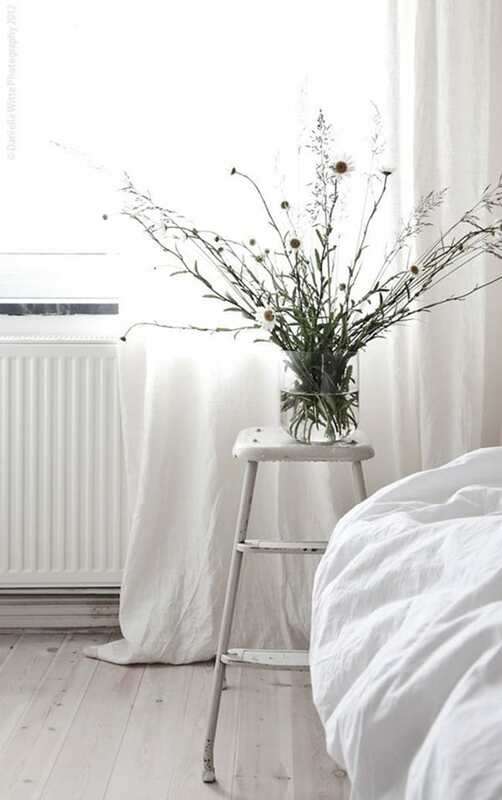 The key to creating a successful all white (or mostly white) color scheme is to make it warm and inviting buy infusing some personality into the space. 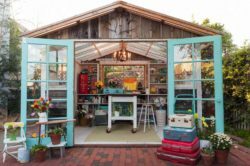 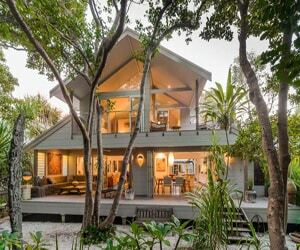 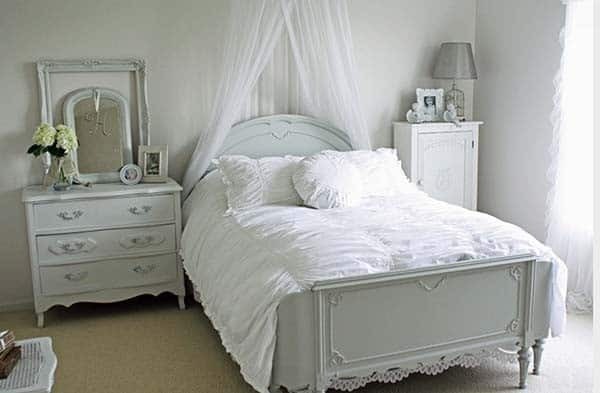 This can be achieved by adding decorative objects such as some silver candle bases and vases, adding greenery with plants, tossing a throw at the end of the bed or injecting some warm woods in the furnishings or the flooring. 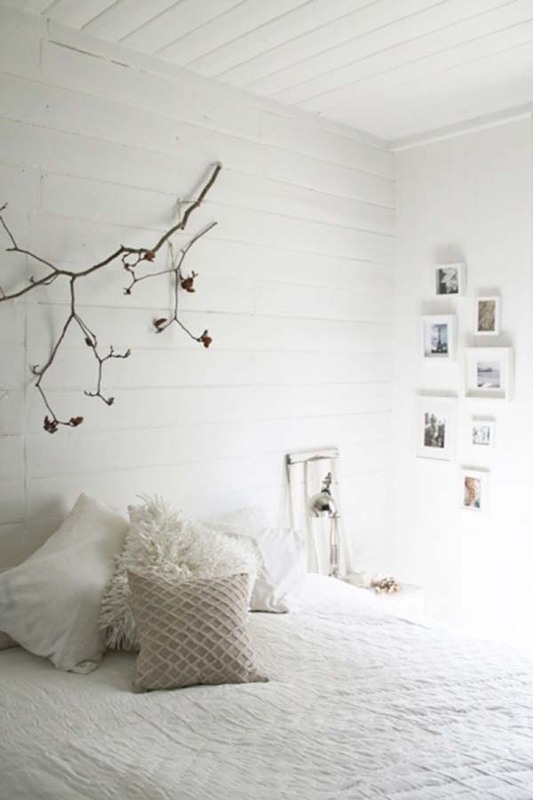 White is the color of purity, it is easily combined with any other color, making it easy to work with. 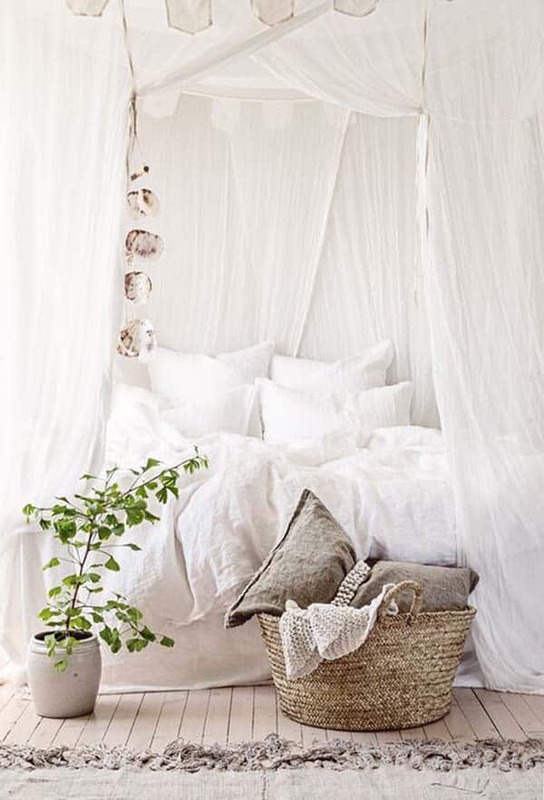 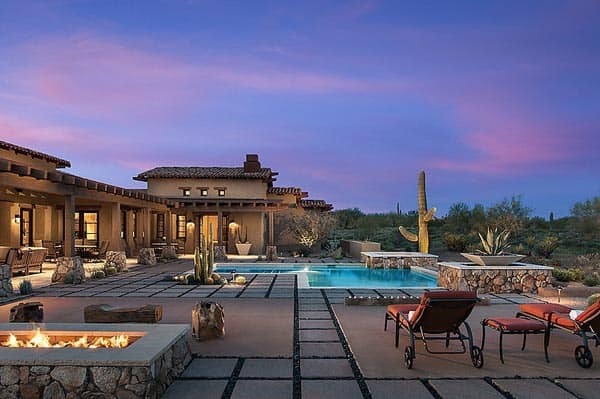 It creates a very relaxing and peaceful atmosphere, which is perfect to retreat to at the end of a long day at work. 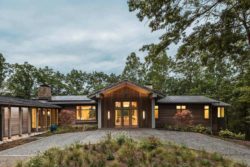 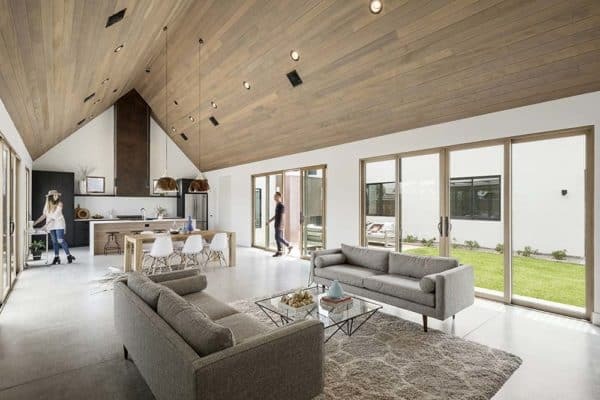 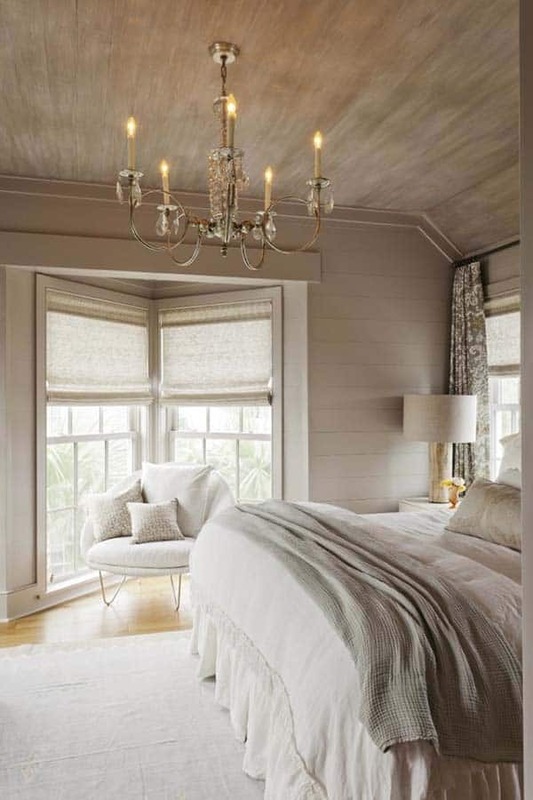 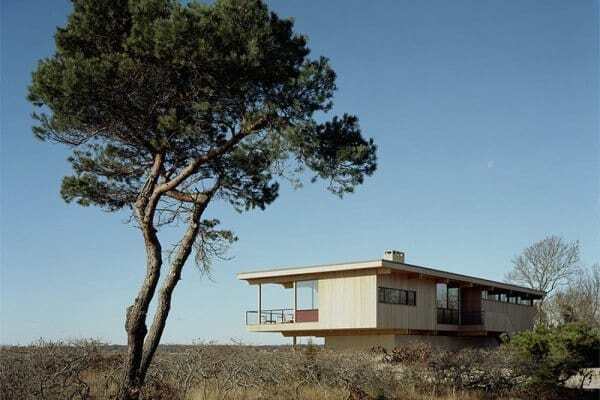 You can also add hints of beige into your design scheme or even grey to add more warmth and layering. 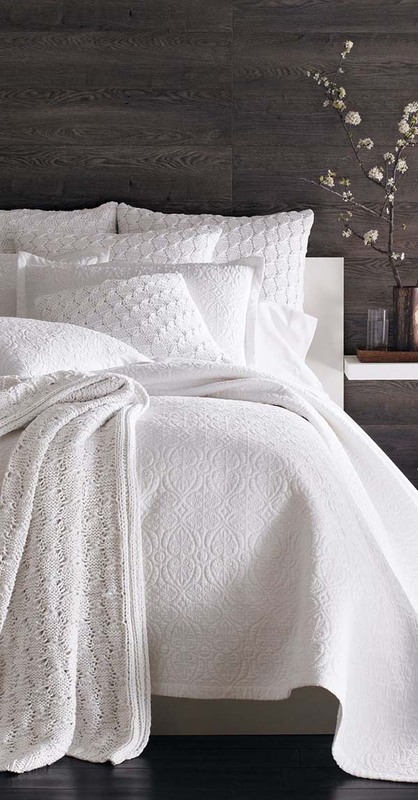 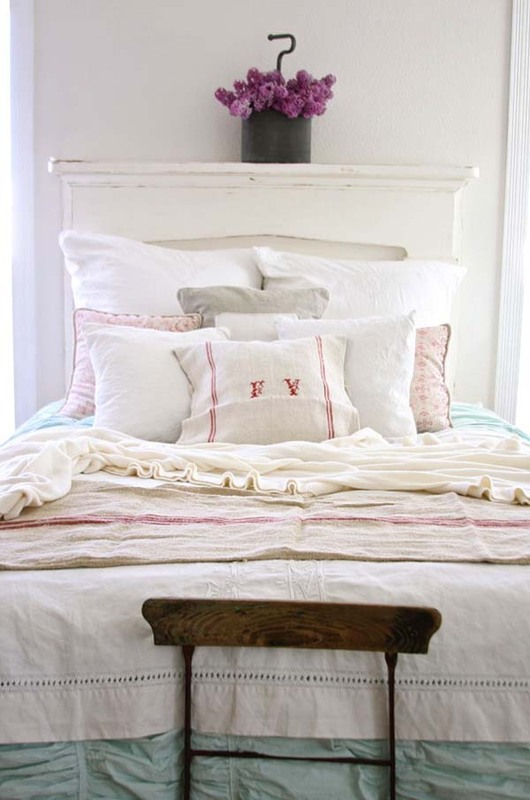 Bedspreads are the perfect way to add layering and texture, starting with the bedsheets, then adding a blanket, a duvet or coverlet on top and complete with a throw. 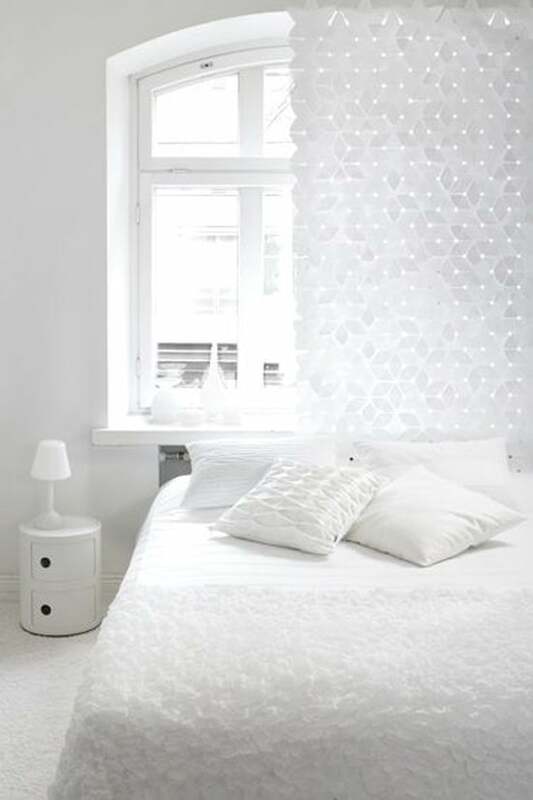 The layering of pillow can also help to make a dreamy bedroom scheme, with different textures and patterns, they can really help to jazz up a white palette. 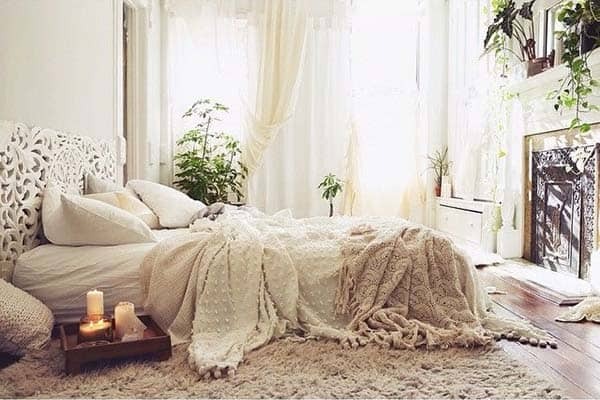 To create a more romantic ambiance, the use of crocheted bedspreads, antique and vintage furnishings and some candles can really help to lighten the mood. 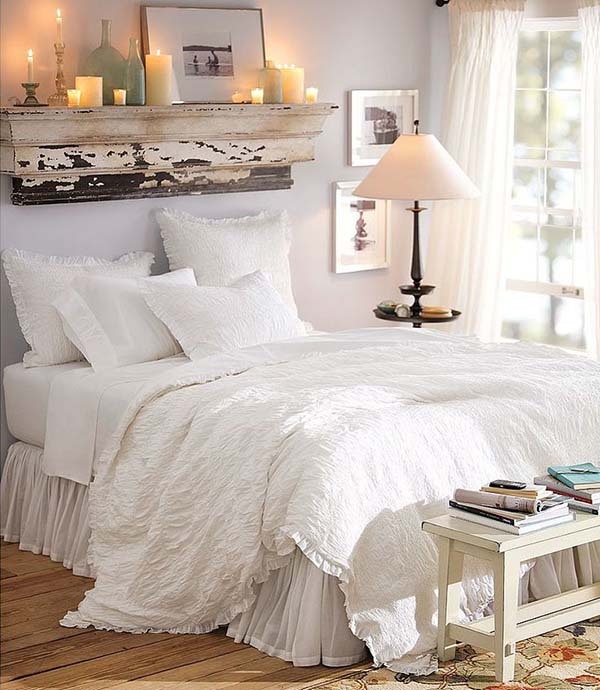 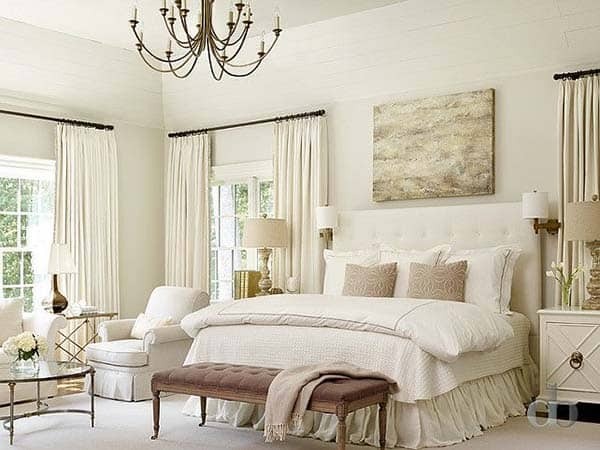 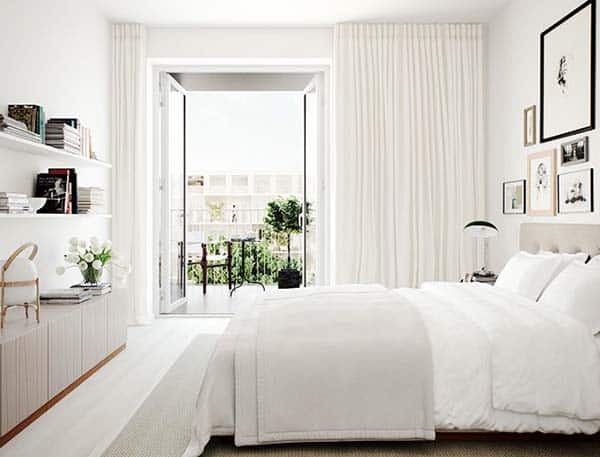 We are here to tell you that an all white bedroom that looks amazing is possible! 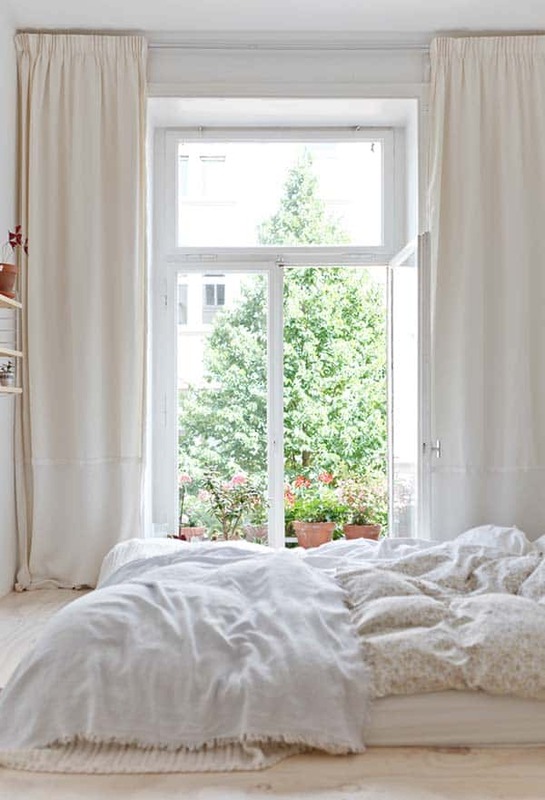 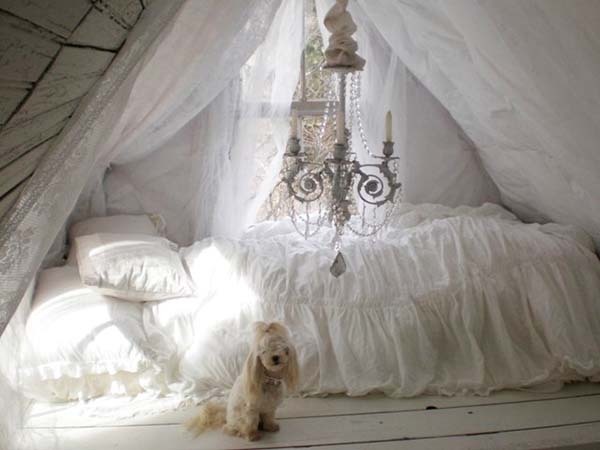 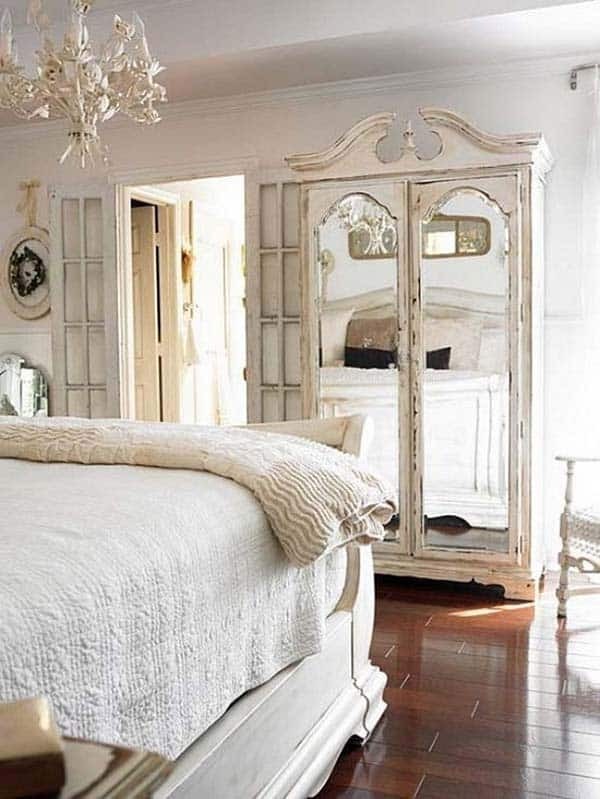 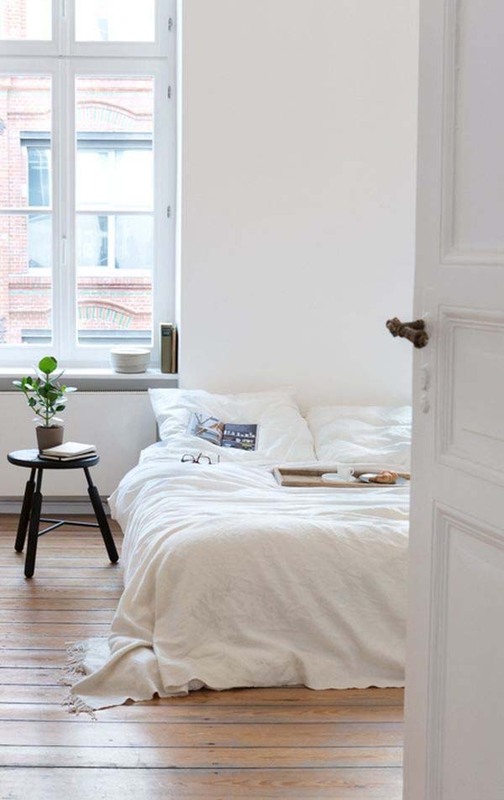 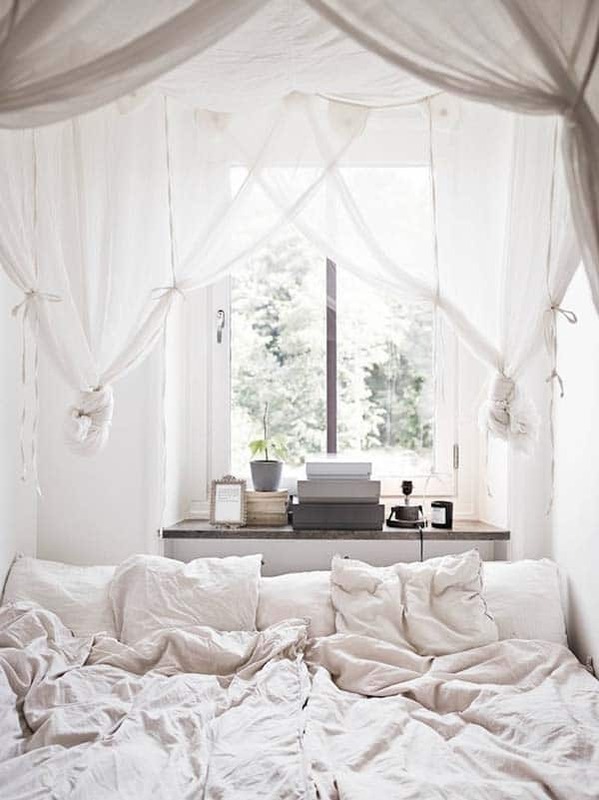 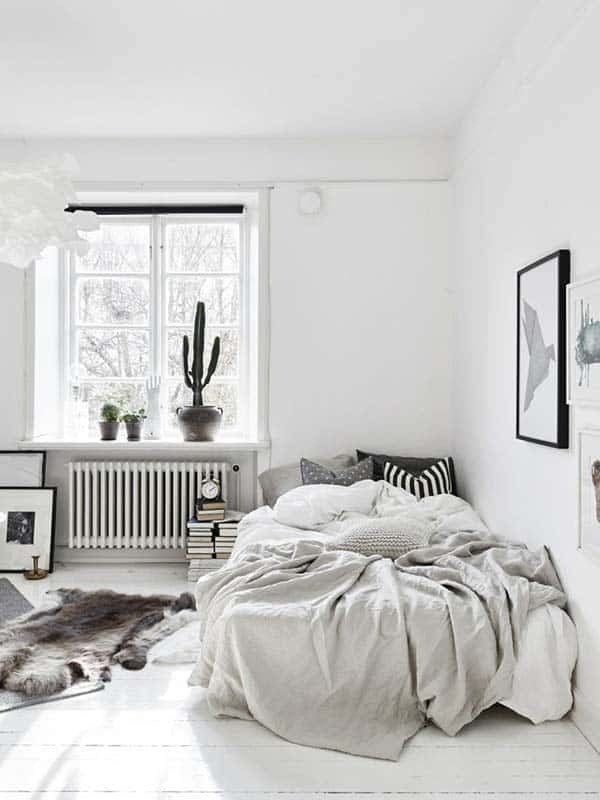 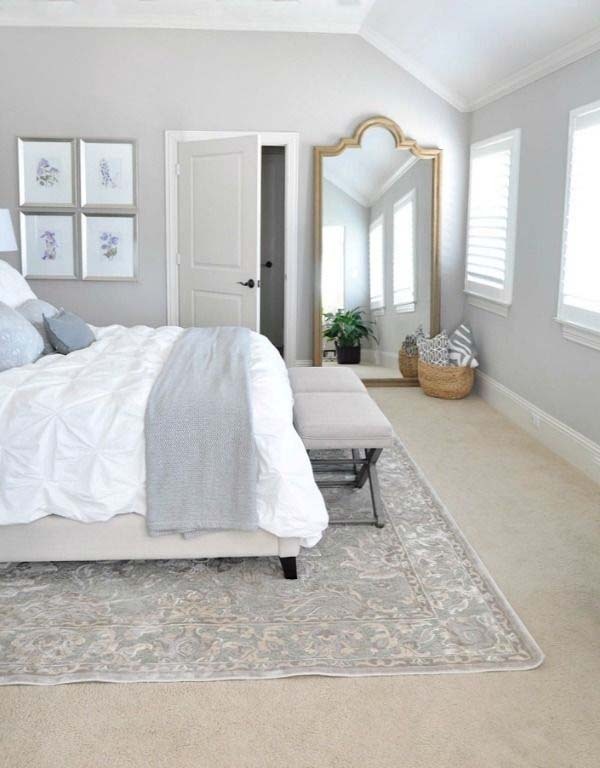 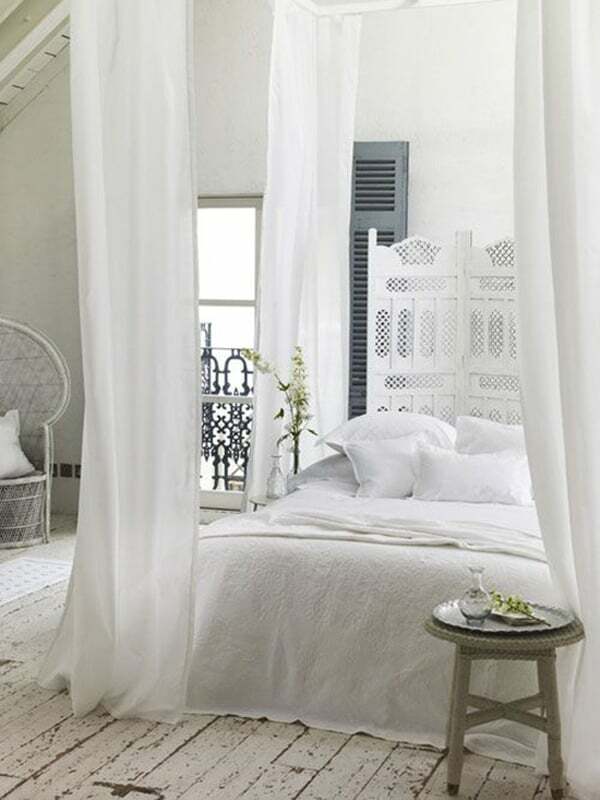 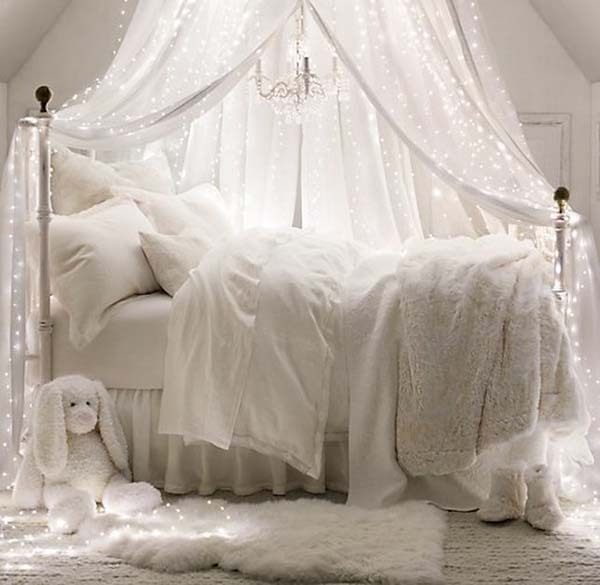 Don’t take our word for it, have a look below where we have gathered together some very inspiring bedroom pictures for those of you who would love a white dreamy bedroom! 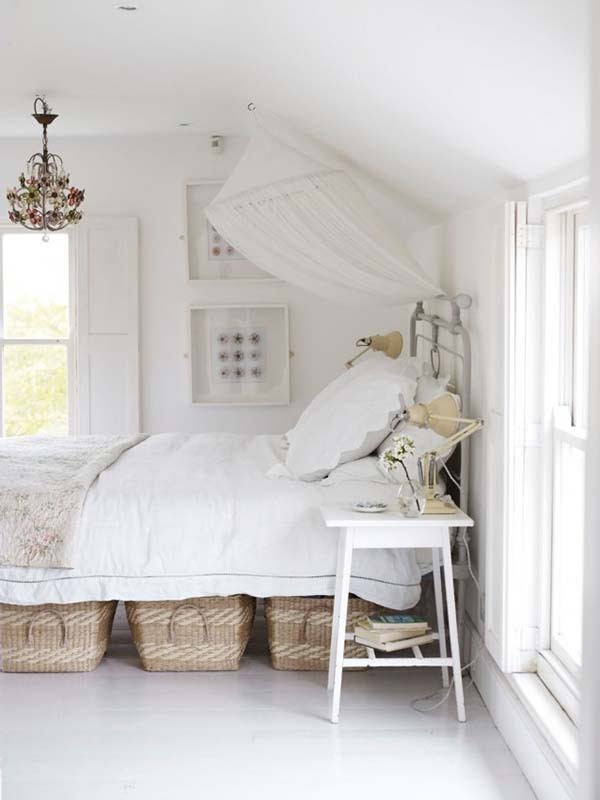 Want more inspirational bedroom decorating ideas? 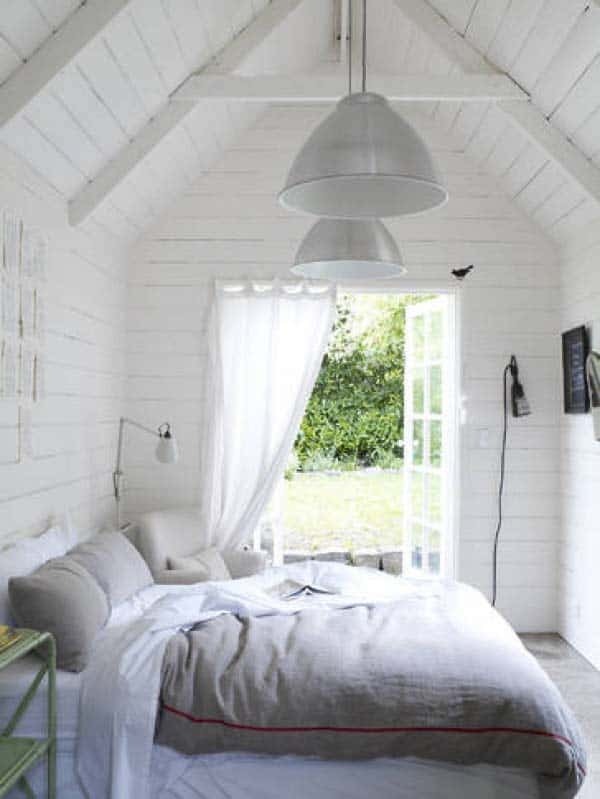 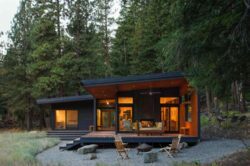 We have presented plenty of amazing ideas here on 1 Kindesign, so in case you missed them, have a look at a couple of fabulous ones: 48 Incredibly unique and inspiring bedroom design ideas and 46 Ultra fabulous bedroom design ideas.